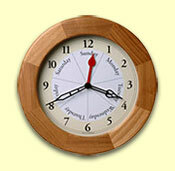 Great prices and huge selection of calendar clocks including desk clocks and digital calendar clocks. Shipping included! Gives you the time and the day! Great item for the carefree among us who need reminding. Solid oak case 9 1/4" across; glass lens. Choice of light or dark finish. Uses one AA battery. $59.95 - GROUND SHIPPING INCLUDED when ordering on line! Gives you the time and the day! Great item for the carefree among us who need reminding. 13" round plastic case and lens. Uses one AA battery. Gives you the time and the day! Great item for the carefree among us who need reminding. 11 3/4" round solid wood case; glass lens. Uses one AA battery. 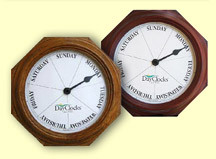 DAY, NIGHT & TIME for All Ages - NEW ITEM ! 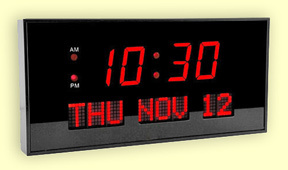 Finally, a traditional clock, PLUS a quick reminder of what day it is and whether it is morning, afternoon, evening or night! Great clock for a busy office, an elderly parent, a child, seniors, lobbies of extended care facilities, or simply the more frazzled among us. Metal frame, brass bezels, glass lenses. Hardboard panel with vinyl finish. Choice of twelve different panel finishes. 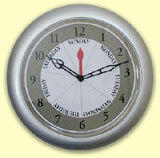 Clock and Day dials are 8 1/2" diameter. Overall dimensions are 31" W x 11" H. Two wall anchors and three AA batteries are included. 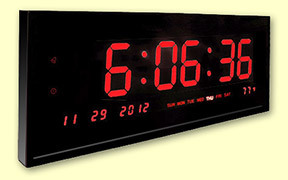 Comes with batteries installed and day and time set - simply mount it on the wall !